The 31.22 metre motor yacht Hakim 7 has had a $3,010,000 price drop with Brian Hermann at Ardell, equivalent to a 50% cut. Designed by Frank Mulder, she was built by the Dutch yard Euroship Kees Cornelissen in aluminium to RINA class and launched in 1990 with a refit in 1999. MCA compliant, her interior by Studio Delta accommodates eight guests in four staterooms plus five crew and all staterooms have en suite bathrooms. She is equipped with a chilled water air conditioning system, has hydraulic-powered doors and comes complete with a scuba diving room. Twin 2,610hp MTU engines coupled to KaMeWa water jets give her a cruising speed of 28 knots and a range of 2,750 nautical miles at 25 knots. 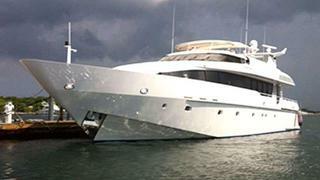 Lying in Belize, Central America, Hakim 7 is now down from $6 million to $2,990,000.